Having surprised Iñigo with my CBT, there was suddenly a mad rush for me to get kit in order for me to actually ride a bike. 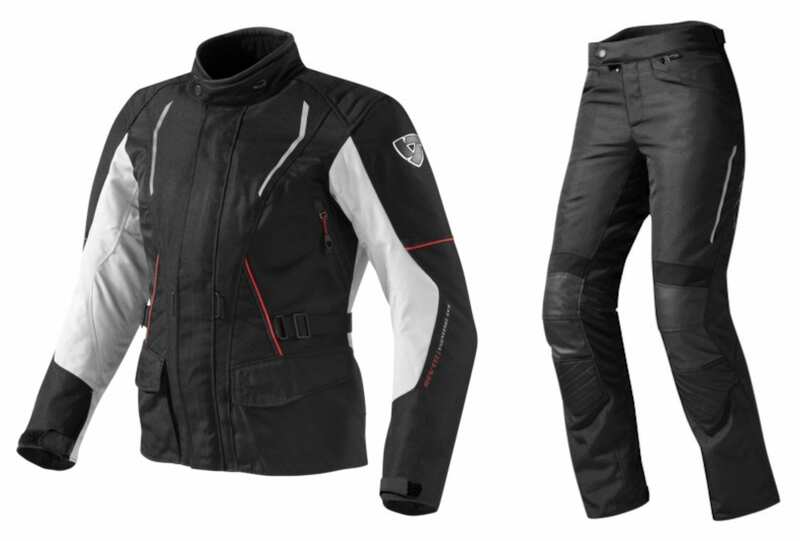 However, the options offered to women, when it comes to motorcycle suits, are rather limited in comparison to the many brands, styles and sizes offered to men. Add my relatively large hips, tiny torso and minimum height into the equation and the hunt for textile, waterproof jacket and matching trousers becomes virtually impossible. After trying on various jackets that were too tight around the shoulders, consequently cutting off all circulation to my hands, and being unable to squeeze several trousers up past my knees, we discarded certain brands like Dainese as options. It seems that these brands suit the taller, narrower Italian frame. Eventually, after much help, advice and patience from the staff in GetGeared Leatherhead, I ended up purchasing the Rev’It! Monroe Jacket and Factor 3 Trousers. We soon discovered that being a brand from the Netherlands, Rev’It! certainly caters for the broader woman, yet continues to provide good design and shape in their clothing. It has to be said that this suit has been tested under all the extreme climates you could possibly imagine when riding over 7000 miles. It has battled through torrential rain, which would not allow me to see more than a metre in front; has insulated me when we stupidly decided to go on a ride in the snow to get a cool photo, excuse the pun; has shielded me from the gusts of Cornish wind that sent my bike sideways and offered protection in the extreme summer heat in France. I must say, that I am most impressed with how this suit has handled all of the above situations. I have never, ever, gotten wet, which is a miracle considering the weather I have ridden in. Considering the price that I paid for the suit, and the fact that it is not GORE-TEX, I was expecting the suit to fail on me once or twice with age and ferocious rain. Yet, over a year after purchasing it, I must hand it to Rev’It!, it seems they have created a suit of wonders! Their equivalent to GORE-TEX, the Rev’It! Hydratex | Z-liner, works magnificently and although the top layer of the suit gets wet and ever so slightly heavy in the rain, this has no effect on the rider as not drop of water passes through into the internal layers. I have never had to wear additional waterproofs. When the suit is wet on the outside, it is ever so slightly cooler to wear, but I have found that with the thermal liner inside and appropriate clothing underneath, this is not a problem. Additionally, the suit takes next to nothing to dry out. I have always hung it up on arrival at my hotel and returned the next morning to a dry suit. The part I like most about the jacket and trousers, is the detachable thermal lining. In winter, this extra padded layer gives you a bit of added warmth and protects you from the elements. Remove the lining in summer, and you have a light protective shell. Not only is the suit great for days when it is drizzling or you simply do not want to wear jeans and prefer that extra protection, but it is also fitted with brilliant ventilation for those hot long summer rides. Opening up all the ventilation offered, provides a steady and constant airflow which was necessary in France this summer gone. As for the fit… it is clear that this suit is perhaps not the most figure hugging in the market for women at the moment. However, it has straps that can be adjusted to enhance or exaggerate the waist, the trousers come in many different lengths which is ideal for the shorter woman like myself and I can move freely when wearing it – it is most definitely comfortable. In hindsight, I would have bought the all black version of the jacket as the white areas of mine are now stained and look rather dirty after travelling all over the place and being the graveyard of many bugs. Yes, there are ‘prettier’ suits on the market but quite frankly for someone of my build, my height and with the budget I had originally set myself, this kit has superseded all expectations. At just shy of £400.00, I would certainty recommend it for any touring lady out there!